These days my day starts at 9am, because at 8am I’m still dueling it out with my 3-year old over what she will wear to pre-school, and a 3-year old is impervious to attempts to reduce Non-Productive Time (NPT). At 9am, I arrive to the client’s office, dock my laptop, and open up Outlook to check for new email. Right about that time the new team member that’s just transferred back from Australia pops in to my office. Except it’s actually a cubicle. But it’s a big cubicle. He asks how to book a conference room in an Outlook meeting invite and checks my screen, scanning my Outlook ribbon for anything that stands out as different from his. I explain that the room-booking tool is a plug-in that he needs to download, and I recommend that he also download the Outlook plug-ins for MS OneNote and WebEx, an online meeting tool. Back to reviewing new emails, I notice that there’s a new one in the “External” folder that everyone in the company was mandated to create, along with the Outlook rule that sends every email coming in from sources external to the company into this External folder so that possible phishing attempts are more easily identified. Next, I open up MS Teams and look for new chatter from any of the several international projects I support. Soon, one team will be ready for me to edit and format a group of documents going out for review by the leadership, ensuring that I incorporate all “global changes” they agreed to going back to the start of the project, such as adding a space before and after a slash mark “/”, ensuring that they used “Conceptual Site Model” instead of “Site Conceptual Model,” among many others. Then, I open up MS OneNote, select the notebook I share with my supervisor, and click the “Find Tags” button to pull together a list of to-do’s assigned to me from various knowledge management efforts. I check Workplace® by Facebook to see if there are any new people requesting access to one of our four Communities of Practice (CoPs). I look up their titles to make sure they have a business need to join, approve their requests, add them to an email distribution list, and add them to a members list on the CoPs’ SharePoint sites. Now I pick up where I left off yesterday processing and analyzing a year’s worth of data that was collected around the CoP sites – who visited and which pages they visited, whether they were a member of the CoP or not, which business units and countries they were from, what content they downloaded, among other technical data. My supervisor wants to measure the effectiveness of the CoPs in their mission to connect people and content. He says, “you can’t manage what you can’t measure.” “Big data” is the “new big thing.” Currently, my dataset is in MS Excel. It began as a data-dump all run together on a single tab. Yikes. Thankfully, with macros and formulas inside of formulas, I can split out the data very quickly. Microsoft’s Power BI (BI stands for Business Intelligence) app in Office 365 makes analyzing it a breeze. In a month, the CoPs will be migrated to SharePoint Online where we will be able to audit data like this much easier, and without Excel. Speaking of data migration, I remember that the OneNote notebook I share with my supervisor is still sitting on a shared drive. It’s time to take the leap into full cloud computing by migrating this last item. My supervisor has been hesitant to try it sooner. I migrate the files to our SharePoint Online site and update the sync location in OneNote. Flawless. My supervisor says, for probably the hundredth time, that he owes me pizza. I’ve never received a piece of pizza yet. I happily look over the three notebooks I have open in OneNote – the shared one that is now coming in from SharePoint Online, a second that is linked to my OneDrive online, and the third that comes in through an external Office365 cloud that I use for my J. Wilson & Associates notes. It feels good to be linked and synced, especially when I can get all this information on the go using the OneNote app on my smartphone. Around 11am my manager swings by and asks if I have time to cleanup a Standard Operating Procedure (SOP). “Of course,” I reply. The answer will never be “no.” The cleanup involves putting the content into the company template, editing for the usual suspects, and ensuring clarity of message, consistency, and organization. I ask when he needs it back. “Can you have it done by early next week sometime?” (It’s only Monday.) This response always pulls at my heartstrings and makes me wonder about his bad experiences from Technical Writers past. “I’ll get it back to you later today,” I reply. The facial expression of a weight being lifted is all the thanks I need, despite promises of pizza. After lunch, I meet with someone I refer to as the “SharePoint guru.” He’s got all the permissions. I work with him to add a form to a SharePoint page I created for one of the projects I support. When someone fills out the form, different workflows will be triggered based on the submitter’s selections. We automate fields to save the submitter time, such as the user’s name and the date of the submittal. Notification emails with hyperlinks will get sent to the appropriate reviewer, with a confirmation email sent to the submitter. Efficiency, and especially automation, make me happy. After some testing, the form is ready for use. When I get back to my desk, I have a new email waiting. A manager in one of the California offices has asked me to upload a bunch of that team’s files to SharePoint Online. I drop the files into the corresponding project and use “Quick Edit” to quickly and easily add metadata to all the files at the same time. With Quick Edit, applying metadata (or, document properties) is as easy as dragging the contents of a cell down in Excel to apply to others in a column or row. I let the manager know that I’m done. “How do you do that so fast?” he asks. “Practice,” I reply. Using technology and knowing the intricate, time-saving processes in programs contribute to how this is really done. Around 1pm I start editing and formatting the SOP. I send it back to the author around 3pm, and pick back up where I left off processing, analyzing, and summarizing (translating to meaningful information) analytics from our CoP sites. An hour later I get a knock on my cube and look up to see a team member from down the hall. He asks to show me something on his computer that he’s trying to do with an asset inventory in Excel. He shows me, and I quickly determine that he wants a data validation (this is a fancy term for a drop-down list). I show him the steps, and then tell him to just shoot the file over to me and I’ll get the sheet fixed up for him. On my way back to my desk, I hear another shout for help coming from my manager’s office. In this case it’s an actual office, but with glass doors. “Technical Writer to the rescue!” I exclaim upon arrival. A lot of Office NPT is reduced simply by being present to assist with software process questions and to facilitate and smooth the use of time-saving technologies. This keeps teams on track and allows them to stay focused on the important stuff. While they work on improving operating efficiency in the field, I improve their operating efficiency in the office. Katharine (Katie) Farnham holds a B.S. in Chemical Engineering from the University of Houston. Instead of pursuing a classical engineering career, she opted to start at a small Technical Writing firm specializing in the Offshore and Oil & Gas Industry. During her time at the firm, she managed two departments responsible for all forms of the company’s documentation development. Additionally, using her engineering background, she designed and taught several offshore-related classes (classroom and computer-based) to new Technical Writers not familiar with the technology or terminology. After six years, Katie moved to another Technical Writing firm where she continued using her leadership skills to manage several large-scale projects for clients in the Offshore Oil & Gas Industry. These projects included developing operating procedures for government / regulatory approval (e.g., the U.S. Coast Guard, Materials Management Service, American Bureau of Shipping) and reporting or inspection audit software for drilling rigs. Her favorite part of the job was frequent visits to the facilities (both on and offshore). Primary responsibilities with these projects included schedule and budget tracking, overall direction, coordination and quality control, as well as meeting with client regulatory coordinators and agency representatives as needed. In order to keep up to date with the industry’s technological advancements, Katie also acted as a technical scribe for Hazard and Operability studies (HAZOPs) and Hazard Identifications (HAZIDs). She was chiefly instrumental in establishing and implementing a standard review, recording, and reporting process. When this firm decided to move in a new direction after seven years, Katie was hired at J. Wilson & Associates as a Project Manager / Documentation Specialist for Shell’s Projects & Technology Technical and Competitive IT (TaCIT) department. This was a huge career change as the job entailed comprehensive knowledge of geophysics and geology. The first project she completed, with the help of several Shell mentors, was a classroom-based training class on Quantitative Interpretation Theory and Applications. As her knowledge of geophysics and Shell’s proprietary software increased, she took on projects such as user software / training guides for a Seismic AVO Interpretation plugin and Basin Modeling software applications. Over the last decade, many large companies went through periods of transition and restructure. During Katie’s time at Shell, several occurred. Through each restructure, she found her responsibilities and skills increased. She created and maintained a SharePoint web portal spanning five different software groups which covered an entire software portfolio (from Seismic Interpretation to Production Drilling). Since the days of physical classroom training had passed, all software user / training materials were translated to an online, interactive format for users worldwide. Additionally, an eSupport program was designed and launched to link the proprietary software to help files. The final touch for the customer-centric user experience was the design and roll out of a UserVoice feedback website where administrators accumulate and analyze user feedback (e.g., software bugs, upgrade ideas) and turn it into actionable data that drive informed software product decisions. On top of her regular responsibilities, Katie also took on special side projects. One that stands out in particular was working on a special edition of the Shell Journal of Technology. This is a restricted journal that is shared with Shell staff and associated companies (but not third parties) in order to encourage improved technologies or procedures. Benefits described are those that have been realized, or are to be expected, within the Shell Group using the new methodologies. This accomplishment stands out to Katie as a very proud moment in her career as her contribution to this product was extremely technologically challenging. As throughout her career, Katie continues to grow professionally. Even though technology and methods of communication are continually changing, the fundamentals remain the same. She embraces the importance of adaptability, flexibility, and versatility in an ever-changing workplace – qualities that are key to assisting clients with improving productivity and efficiency whatever the industry. We all have certain websites that we need to use for work on a daily basis. For those of you using Internet Explorer, this Tip/Trick shows you how to open all of those sites at once with a single click. Tip: With some minimal setup, you can soon save time and effort in opening up frequently used webpages. First, open Internet Explorer and view your Favorites bar. If you don’t see your Favorites bar, first right-click in an empty space to the right of a tab / browser window as shown in Figure 1. Click on “Favorites bar” to turn it on. When prompted, give the folder a name and click Create. 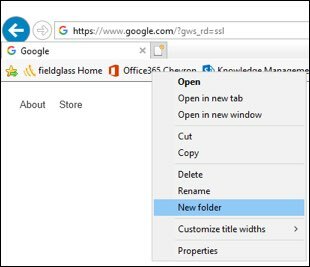 If you have a lot of favorites, you will likely have to locate the new folder at the bottom of your favorites list by clicking the double arrow at the far-right of the bookmarks bar to expand the list, then navigating to the bottom. When you locate the new folder, click on it with your cursor (holding the left mouse button down) and drag it up to a visible location within your Favorites bar. Finally, simply drag and drop any of your favorited bookmarks into the folder. Get more Tips & Tricks in the online archive on our website as they are added with each new newsletter. Ever wondered what a day looks like having a Technical Writer? At J. Wilson & Associates, Inc. we take a lot of pride in the diversity of experiences and skill sets that make up our highly successful team. This month we’re highlighting our longest-serving “Associate” of J. Wilson & Associates: Sr. Technical Editor, Katie Farnham.